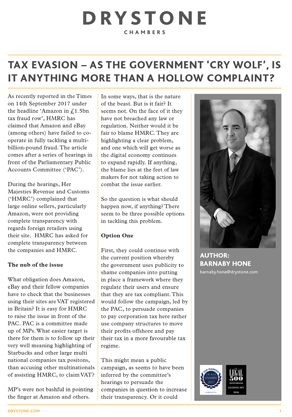 The following article by financial crime specialist Barnaby Hone is a topical one, following much discussion in the media about the tax position online retail giants like Amazon, eBay and their ilk find themselves. Are they co-operating with HMRC as best they can? How can the situation be remedied to ensure HMRC are assured of a transparent and consistent tax arrangement without harming what is a huge growth area of business? In this interesting opinion piece, Barnaby tackles these issues and suggests some possible ways forward. Barnaby has a range of experience in fraud, international asset recovery, financial crime and professional discipline law, particularly in healthcare and sports law matters. He is regularly instructed in tax tribunal matters (in a POCA context) and civil recovery. Barnaby's international asset recovery and financial crime practice includes experience of dealing with corruption, money laundering, fraud offences (that have an international angle) and recovering the proceeds of these offences.